Humans are trapped in strange and strange situations according to their need. Let's say you have a network cable, but no Wi-Fi router, but five people have to use the internet at the same time? Or you have a 3G dongle that works on a laptop, but there is no work for the Wi-Fi only tablet. It is possible that you too may be trapped in this situation. How good it would be to have your internet connection shared without any router on all users and devices.You can share the internet connection of your laptop or desktop with other device via Wi-Fi, and for most of the time it is very easy to do this. Mac users do not have any problems because setting up Internet Sharing in OS X is a few clicks of work. However, for Windows users this process is slightly screwy. Built-in options also sometimes do not work due to complex setup process and reliability problemsHappen. Internet sharing on Windows 7, Windows 8, or Windows 8.1The good thing is that in Markt there are many applications available to transform your machine into a Wi-Fi hotspot. But before using it, get information about Windows built-in sharing on Microsoft's website. Hope that your luck will be better than us. We suggest that you ignore this process and use the third-party app as it will generally have better experience.We tested Popular App Connectify and Virtual Router Plus. The experience with Virtual Router Plus is poor. The installed anti-virus described it as a threat to the system, and during the installation it tried to install many unauthenticated software. There was no such problem with Connectify. 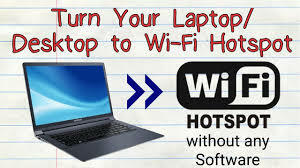 This is a trusted app for translating your computer into a Wi-Fi hotspot.For this process you will need to use a Windows computer, which has a Wi-Fi adapter (or built-in Wi-Fi). If your computer does not have Wi-Fi, you can buy one that connects via USB. Follow these steps to make the Windows machine Wi-Fi hotspot:1. Download and install Connectify. Installation is very straightforward and when you're done you can restart your computer.2. After the computer restart, check whether it is connected to the Internet or not. If so, run the Connectify Hotspot.3. You will be able to see two tabs in the app - settings and clients. In the Settings tab, "Create a ..." Click on Wi-Fi hotspot inside.4. Under the Internet to share you will see a drop-down menu. Expand it and select the connection you want to share. We tested this app with wired and wireless connections, both of which were working properly.5. You will see many more options in the menu. Enter the password for Wi-Fi. Click Start Hotspot.All you need to do is to do the same. Now your second device will start detecting a Wi-Fi network called Connectify-me. Enter the password and use the Internet without any problems.Connectify is a paid app, but its free version is also available with some less features. You can create a hotspot with the help of free version, but the biggest drawback is that it will be disconnected every 30 minutes and every time a pop-up will appear, you will be asked to buy a pro version. You must manually re-enable the hotspot every time.Pro version has more features and the cost of one year license is $ 25 (Rs 1,550) and $ 40 (Rs 2,450) for life time. This version includes features like Unlimited HotSpot Uptime, Custom HotSpot Naming, 3G and 4G Networks (USB Internet Dongle), Internet Sharing and Advanced Firewall Controls. Internet Sharing on OS XThis process is very easy for Mac users. This way you can share Mac's internet connection.1. Open System Preferences. After that go to sharing. Then check internet sharing.2. Expand the drop-down menu created after the Share Your Connection On the Right, select the connection to be shared. You can share internet connection via Ethernet, Wi-Fi, Bluetooth or iPhone USB.If you are using a wired internet connection on iMac, Mac Pro, or MacBook Pro, then you usually want to select Ethernet. If you are using an external Ethernet adapter for your MacBook Air, then you would like to select USB Ethernet or Thunderbolt Ethernet. However, this will depend on your dongle (normally it is USB).3. Below it, there is a box next to To computers using. Here you must tickmark the box next to Wi-Fi.4. Then click on the Wi-Fi Options button below the box. Select the network, then enter the password in the security type and password and the Verify field. We will suggest you to enter the passward instead of choosing 'No' in the Security Option. You can leave the channel at the default value, if you do not know what you are doing. Click OK.5. If your connection is active, you will be able to see a green icon. In addition, system sharing will be able to see internet sharing text inside.enough! You can connect other devices to the Internet and start using it.You can translate your PC or Mac into a Wi-Fi hotspot in this way. If there is any other way to do this, tell us through the comments box.